Heels on Wheels is taking off on our fifth annual queer performance tour of the US and Canada April 11-20, 2014. Artists: Heather Acs, Sabina Ibarrola, Damien Luxe, Angel Nafis, Shomi Noise, Alvis Parsley | Check out some photos here! Calendar | Artist Bios | Donate here to help make it happen! 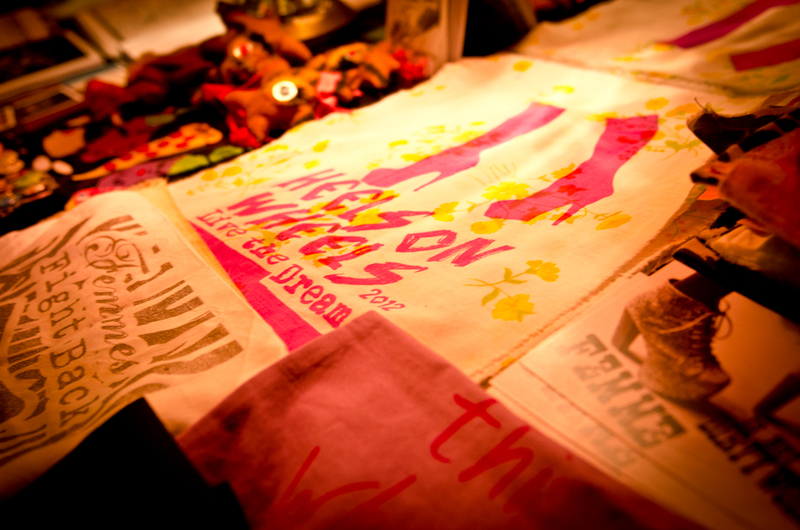 Heels on Wheels is a NYC-based group of queer femme-inine spectrum artists and organizers. The show itself consists of six performers, local acts in every city – and a dance party if you’re lucky! 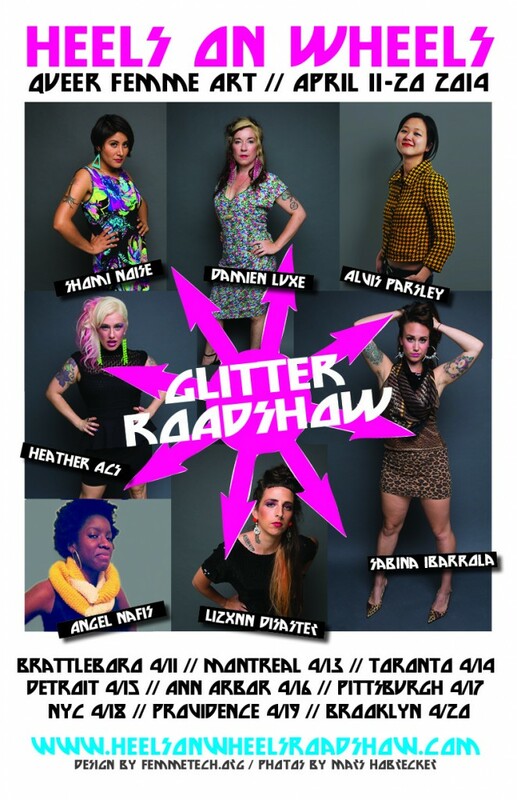 The 2014 Glitter Roadshow features Damien Luxe, Heather Ács, Shomi Noise, Sabina Ibarrola, Angel Nafis, Alvis Parsley, and wrangler artist Lizxnn Disaster. Shomi Noise plays guitar and reads from her zine series “Building Up Emotional Muscles,” the story of her journey as a Bolivian immigrant navigating U.S. culture and finding herself through alternative music scenes. Damien Luxe’s multimedia “Femme Footprints In The Sand” plays with mermaids and powdered milk to explore thriving past poverty and trauma. Heather Ács’ “Welcome to the Waldorf Hysteria” uses multi-media high-femme drag histrionics to reach beyond language and ask, what do we gain when we lose control? Angel Nafis’ poetry celebrates the everything and everywhere of her world, of love and divinity, of her black girl brilliance in its vastness and depth. Alvis Parsley‘s heartfelt confession draws on their experiences as a genderqueer Asian while questioning the roles of institutions, authority, and the ecosystem of the arts with both humor and tenderness. Sabina Ibarrola melts down and melts hearts in a pop culture performative exploration of breaking up and breaking through with the help of karaoke and Carrie Bradshaw. This year also includes a video program including work by Louis Chavez, Kristin Li, Ellie Beth, Jacqueline Mary, and Celeste Chan. Please tell your friends & come out to see the glitter and grit for yourself!! 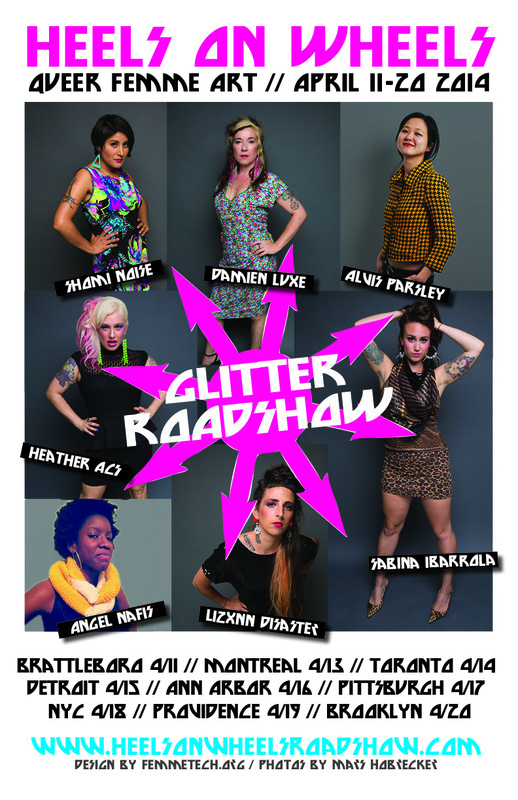 Don’t miss the fifth Heels on Wheels Glitter Roadshow!